First spread over the ground a 15 cm layer of plant wastes such as hay, straw, leaves or woodchips. 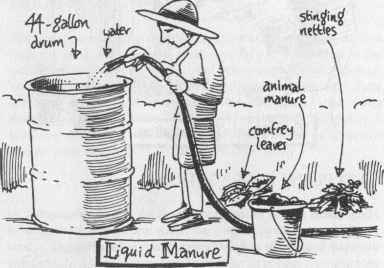 Add a five cm layer of manure. On top of this place a two cm layer of garden soil. Sprinkle on lime, dolomite and rock phosphate. Earthworms will quickly move in, adding their valuable castings to the heap. Every 24 hours, earthworms eat more than their own weight in dead organic matter and mineral soil. Continue to build up the heap in layers until it's about one and a half metres high. Keep the heap moist (not wet) at all times because this will lead to a rapid breakdown of the plant material. Cover the finished heap with a thick layer of mulch. 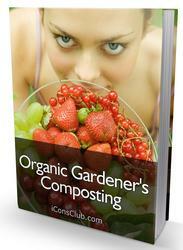 Compost should be ready to use in ten to 12 weeks in the summer months, or three to five months during winter. In colder areas compost can take longer. If you're adding seaweed to the compost heap it should be washed first with a garden hose or else leave this job to the rain. Seaweed contains an excellent assortment of secondary and trace elements. To be ready to use, the compost should be cool, dark, friable in consistency and sweet smelling! Add compost to your garden at a rate of one bucketful to each 30 square metres of soil area. This amount is quite sufficient to promote strong, healthy growth. Apply it approximately four times per year. Spread it around fruit trees and your favourite plants and bushes and use it as a side dressing for vegetables — they love it! Compost water can be used for sick plants and seedlings. Fill a large bucket half full of finished compost, add water to the top and stir it gently. Use the residue as a mulch. Compost can also be used as a valuable top dressing for house plants — every time you water the plants they will receive essential nutrients promoting health and vigour. I have found it a good idea to set aside time for actually 'putting together' the compost ingredients. 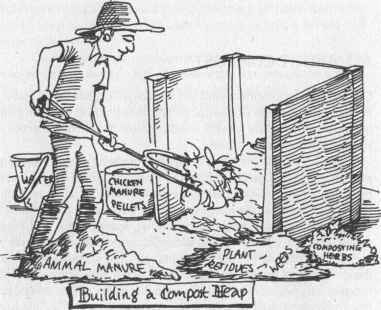 Quite often, without thinking, large amounts of green material (like spent crops and weeds) are placed onto a heap without adding manures, herbs, lime and soil. These should be added in the correct sequence to achieve a good, well-balanced final result. Pile up the green material near the heap, and at a con ven ient time, place the material on the heap in the correct thickness of layers, taking care to add the other necessary ingredients. I always say to my girls: "I'm making puddings today".